Whiplash is a severe sprain of the neck muscles. Whiplash is most commonly diagnosed after an automobile accident, but it can occur with any kind of trauma, such as during sports and exercise. The typical whiplash is when the head is thrust backwards and then forwards. Lateral whiplash can also occur, where the head is thrust from one side to the other. The damage that was done to the muscle during whiplash can heal on its own, however, it can be extremely painful and debilitating. When whiplash occurs, the cervical spine (neck) is also affected. It is very likely that the spine will become misaligned and injured with whiplash. While muscles can heal, the spine cannot re-align itself on its own. It is important to get checked by a chiropractor after experiencing whiplash. Once the spine is in proper alignment, the muscles will be able to heal faster. For more information about whiplash and chiropractic, please contact us at 978-664-1500. We are located at 350 Park St. in North Reading, MA. Communities we serve Chiropractic Care to include Andover, Wilmington, Tewksbury, Woburn, Reading, and Lynnfield. Swimming has a reputation as a low-impact sport, ideal for the elderly and others with mobility issues. However, it is not without risks, especially for elite swimmers. Like all athletes, it is not uncommon for swimmers to over-train: professionals can swim for hours each day, and the constant repetition of the same movements can put stress on the joints, causing injuries which can lead to time away from the sport. The risk of specific injuries depends partially on which stroke is used most often – breaststrokers will tend towards different issues than backstrokers, for example. The most common swimming injuries occur in the shoulders, knees, hips, and back, shoulder being the most prevalent. However, swimmers who use the dolphin kick often tend towards lower back problems, while breaststroke can cause knee and hip problems. Be conscientious about using good stroke technique, even if you are fatigued. The majority of injuries are caused by improper form. Communicate with your coach or trainer about pain, fatigue, and technique. If a specific stroke is causing injury, use it as little as possible until the problem resolves. Cross-train, especially if you are injured. Take time away from the sport if needed. 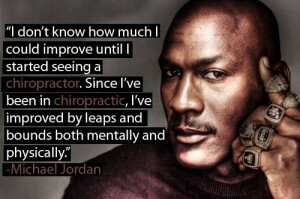 Seek chiropractic treatment sooner rather than later. While some discomfort during training is normal, if pain is persistent, it needs to be attended to. Although athletes tend to be reluctant to seek treatment, the fact is that the sooner an issue is treated, the less severe it becomes – meaning that time away is minimized. Even swimmers who have not yet developed an injury can benefit from chiropractic treatment; a chiropractor can assess which body parts are put under the most strain, evaluate posture, and make recommendations regarding balance, posture, movement, diet, and strength. Furthermore, your chiropractor can help catch injuries as soon as they occur, and place you on a chiropractic treatment regimen immediately. What causes improper alignment in runners? Major causes of improper spinal alignment include running in the same direction on the same course every day; running often slanted surfaces, such as a beach; and not replacing shoes every few hundred miles. There’s a lot that contributes to improper spine or pelvic alignment, and sometimes it has nothing to do with running. It has to do with a day job, where you sit in one particular position all day and then go for a run. The muscles are in a state of tightness on one side and are lengthened on the other, and then you go for a run and your pelvis shifts. Switch positions and seats, if possible, every 30 minutes during the day. Varied posture remains the best posture, according to Duke, so cross your left leg, then a half-hour later, cross your right leg; sit on top of your ankle, sit straight, and even slouch. Try sitting on a stability ball—it challenges your abdominal muscles and allows you to rock your pelvis, which lubricates your joints. Switch between a chair and stability ball, stand, and take short walk breaks if you work in an office. Following these tips helps to prevent future misalignments of the spine but it will not correct the misalignments that already exist. In order to restore even balance to the spine and pelvis, chiropractic adjustments are necessary. With almost two feet of snow on the ground in North Reading, there was a lot of shoveling to be done these past couple of days! Unfortunately, that also means a lot of aching backs. Autumn is perhaps the most beautiful season, especially here in New England but it also means it’s time for yard work. Raking leaves can be a great workout since you can burn up to 300 calories per hour. Unfortunately, since we only rake the leaves a few times a year, our bodies are not conditioned for the stress load. 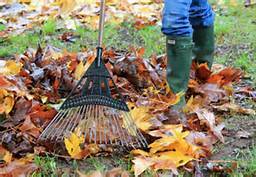 According to the US Consumer Product Safety Commission, nearly 28,000 people suffered injuries from raking in 2008. Gardening is usually one of the first activities of the season where we subject ourselves to sudden bursts of activity and really put our backs at risk. With spring in the air, you look forward to getting out in the garden but you’re not looking forward to feeling sore after all the kneeling, pulling, leaning, and twisting. After a long winter of not moving our bodies this way, it’s important to prepare your spine, joints, and muscles. Growing up on a farm in North Reading MA, yard work has been important in my family and there was never any time for a day off because of back pain. Warm Up and Stretch: As with any form of exercise, stretching must be done before and after the activity. Take a short brisk walk first to warm up your muscles and get your body in work mode. Stretching should target your back and core, shoulders and arms, and leg muscles. Minimize Repetitive Motions: Don’t try to get everything done in one session. Alternating tasks is a good way to break up the repetitive motions. Digging: Make sure you keep the shovel in front of you and avoid twisting motions. If you need to get to an area on the side, re-position yourself to keep the shovel in line with your body. The same goes for raking – pull the rake towards your body, not off to the sides.